If you’re seeking a solution for soft and lustrous hair, try reaching for a jar of coconut oil. Suited to nearly all hair types, this natural oil is packed with fatty acids that may help repair everyday damage, improve texture, and restore health and shine to your hair. Healthy hair depends on protein, which is your hair’s main component. However, chemical processes like dyeing and highlighting—and even daily activities like washing and styling—can damage protein and wreak havoc on your hair. There’s some evidence that lauric acid (a type of saturated fat abundant in coconut oil) may benefit your hair by protecting against protein loss. In a 2015 report published in the International Journal of Trichology, for instance, researchers reviewed a number of studies testing the effects of plant-derived oils on human hair. 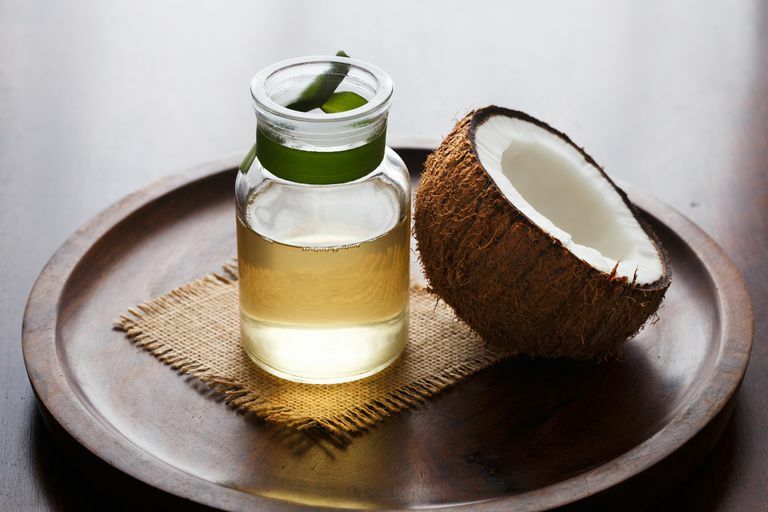 The report’s authors note that coconut oil “has a high affinity for hair proteins” and a unique ability to penetrate into the hair shaft. This penetration is essential for limiting the amount of water absorbed into your hair—a key factor in everyday hair damage. In addition, one of the reviewed studies determined that coconut oil was the only oil capable of reducing protein loss for both undamaged and damaged hair when used as a pre-wash and post-wash grooming product. This study also sized up the effects of mineral oil and sunflower oil on hair. Even though it’s fairly light, coconut oil can weigh your hair down or lead to a dull, greasy appearance when used in excess. To avoid buildup, start with a small amount—no more than a teaspoon—and gently massage the oil through your hair, starting at the midsection and continuing to the ends. For best results, some hair-care experts suggest using coconut oil about two to three times a week. It’s said that regular use of coconut oil can gradually enhance your hair’s texture, ease dryness, and fight off frizz. Some people find that applying coconut oil directly to the scalp can alleviate dryness, but others struggle with issues like irritation and clogged pores. If you’ve never used coconut oil on your scalp, keep cautious by starting out with a very small amount. As a pre-wash protector. When applied pre-shampoo, coconut oil can stop your hair from soaking up too much water (and, in turn, stave off damage and dryness). Try applying coconut oil about 15 to 30 minutes before you wash, focusing on the midsection and ends of your hair. As a styling aid. Just a dab of coconut oil can go a long way when it comes to taming frizz. For easier absorption and optimal styling, make sure to apply the oil to damp hair. As a hair mask. For a super-nourishing hair treatment, massage a teaspoon or two through your hair and let it work its hair-softening magic. You can wash the oil out after a few hours, or leave it on overnight for exceptionally dry or damaged hair. Is Coconut Oil Right for My Hair Type? While coconut oil may benefit all hair types—especially dry, damaged, or color-treated hair—there’s some concern that repeated use of coconut oil may lead to stiffness in those with a coarse hair texture. When shopping for coconut oil, select the unrefined variety and—if possible—opt for organic, sustainably harvested products. If your coconut oil has solidified, simply melt the oil by placing a small amount in your palm and rubbing your hands together. When it comes time to remove coconut oil from your hair, keep in mind that a second application of shampoo may be necessary to completely eliminate the oil. For extra beauty benefits, add a few drops of essential oils like lavender or peppermint to your coconut oil. You can also blend coconut oil with hair-nourishing natural ingredients like yogurt, honey, avocado, or lemon juice. Gavazzoni Dias MFR. Hair Cosmetics: An Overview. International Journal of Trichology. 2015;7(1):2-15.